Attracting over 1,000 delegates from more than 60 countries, PATA Travel Mart is Asia Pacific’s premier travel trade show, featuring unparalleled networking and contracting opportunities to help travel and tourism organisations access decision makers, meet new clients, expand their networks and build or maintain existing relationships. Held in September every year, PTM showcases travel products and services from the Asia Pacific regional market, drawing interest from a broad cross-section of experienced, pre-qualified buyers. 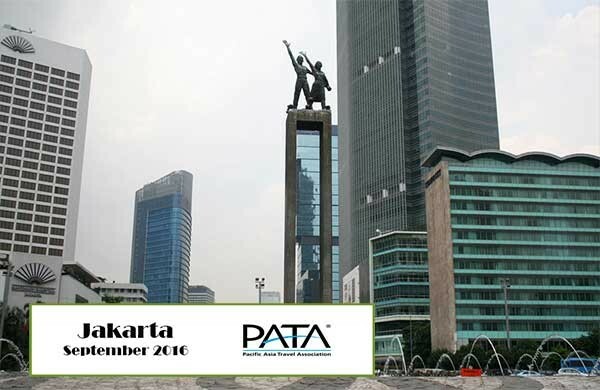 PTM 2016 takes place at the Indonesia Convention Exhibition (ICE) and is kindly hosted by the Ministry of Tourism, Republic of Indonesia in partnership with Banten Province and PATA Indonesia Chapter. Maximise business opportunities: Two full days of over 10,000 pre-matched appointments across the event facilitated through PATA’s custom business matching software. Meet the industry’s A-list buyers: Exclusive access to the 300+ community of qualified hosted international buyers. We bring the world to you: Engage with more than 1,000 delegates from over 60 destinations across the globe. Exciting side events for networking: Socialise throughout the events at the Network Lounge, dinner receptions, late night functions and during the complimentary pre- or post-tours. Cost effective: Special airfare and accommodation rates are available to all participating delegates. Learn something new: Keep abreast of industry updates at the Travel Innovation Forum, Responsible Tourism Forum, and the new Blogger Forum, alongside PTM Talks, a series of 20-minute ‘power’ workshops/seminars on topical issues. PTM also features the PATA Youth Symposium – a half day forum offered to students and young professionals to engage with industry professionals during plenary talks and roundtable discussions. Be inspired: The prestigious PATA Gold Awards Ceremony is also held during the Mart, an event that recognizes and rewards outstanding achievements in the travel industry in the Asia Pacific region in a broad range of categories. Unlike other travel trade exhibitions, PTM offers delegates a different host destination each year, showcasing the rich cultural diversity of destinations across Asia-Pacific while bringing together a new set of buyers and sellers to every show. ICE is Indonesia’s biggest convention and exhibition centre with eco-friendly and energy-efficient features. It is located in Bumi Serpong Damai, or BSD City, one of the most advanced planned cities in Jakarta and features a range of lifestyle amenities including numerous 3- and 4-star chain hotels. The centre of Jakarta can be reached in 40 minutes via Jakarta-Merak toll road, while Soekarno-Hatta International Airport is only 30 minutes away. With its dedicated train station, the city is part of Jabotabek’s rail network. The TransBSD feeder bus lines in the city link into the bus-way lines that cross the region. The surrounding province of Banten enjoys rich cultural heritage and pristine natural resources from secluded islands to landscaped resorts, including spectacular golf courses.